Apple is asking publishers to set two e-book price points for hardcover best sellers: $12.99 and $14.99, with fewer titles offered at $9.99. In setting their own e-book prices, publishers would avoid the threat of heavy discounting. 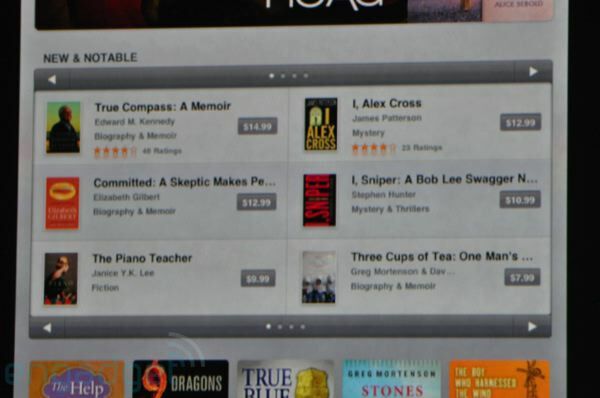 Apple would take a 30% cut of the book price, with publishers receiving the remaining 70%. Why should she buy a book for $14.99 on your device when she can buy one for $9.99 on Amazon on the Kindle or from Barnes & Noble on the Nook? You mean you won’t be $14.99 or they won’t be $9.99? Uh… the prices will be the same… Publishers are actually withholding their books from Amazon because they’re not happy. Optimistic pundits took this to mean that iBooks would sell for $9.99, even though the one featured most prominently in Steve Jobs’s demo, Ted Kennedy’s True Compass: A Memoir, seemed to be priced at $14.99, and some of the other books cost $10.99 or $12.99. But it now seems more likely that Jobs’s first answer means what Mossberg was clearly worried it would mean: the prices will be the same because Amazon prices will be forced up. Traditionally, publishers have been prevented from controlling the retail price of books by the prohibition against resale price maintenance in many jurisdictions. Resale price maintenance hasn’t been per se illegal in the US since 2007’s Leegin Creative Leather Products v PSKS 511 US 877, though it will still be illegal if it imposes an unreasonable restraint, and is still per se illegal in places like Australia. But an arrangement of agency, rather than sale and resale, can avoid these restrictions and give the publisher full control of the final price to consumers. 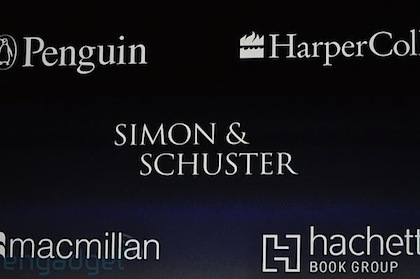 Eagle-eyed readers will notice that Macmillan is one of the publishers featured in the Apple keynote address, and the alignment of prices and rumours terms makes it pretty clear that at least the following has happened: Macmillan found that it could get a better deal selling through Apple, and is now looking for the same deal for all of its electronic books. There’s no evidence that Apple encouraged Macmillan to increase its prices through Amazon—Macmillan wouldn’t need any encouragement—but the increase would certainly benefit Apple for the reason Walt Mossberg identified right away, and the whole thing makes Steve’s response a little prescient and creepy. It’s a pretty screwy situation where the introduction of a new competitor has the effect of increasing prices, and as Macmillan author Cory Doctorow points out it’s a problem of concentration at the levels of both production and distribution. Books (and movies and music and so on) are economically a little weird anyway, since in some sense every book occupies its own market and has no close substitutes: if you want True Compass you’re not going to buy The Golden Compass just because it’s cheaper. Since there’s only muted price competition between books themselves, we rely on price competition for each book at the retail level. And even though retail physical bookselling is also fairly concentrated, it’s still the most competitive part of the supply chain, and with up to 40% of the cover price going to the retailer there’s a lot of room for different business models, improvements in efficiency, and real bargains for readers who want to shop around. With electronic books it’s a slightly different story, since the cost of distribution is very low (and the marginal cost of distribution is zero), but there’s still a lot a retailer can do to differentiate itself: offer a subscription model (like Amazon offers through Audible), bundle e-books with your 3G data plan, and other things I can’t think of because I don’t have an MBA. Publishers should demand and receive a fair wholesale price, but consumers need choice and competition at the retail level. It seems to me that insisting on an agency model threatens to foreclose this competition and could stifle innovation right when the emerging industry needs it. It’s only one publisher so far, and only one territory, but it’s worth keeping an eye on.